Hi all! I'm taking part in Beth Anne's Best's blog hop this Advent and I'm really excited about it! 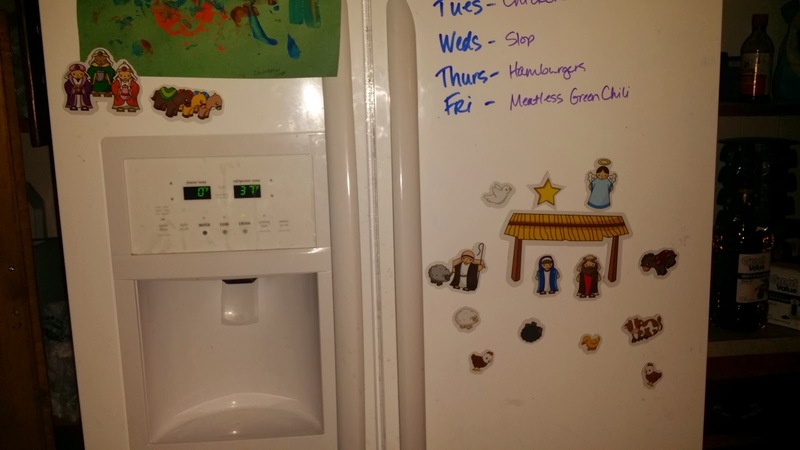 Something that I'm constantly thinking about throughout the liturgical year is how I can make things exciting for the boys and also help create traditions that they remember for years. Since I wasn't raised in a particularly religious home, most Holy days seemed to pass by without notice. We didn't have things that we did for special saint days, and we weren't baptized so obviously we didn't do anything celebratory for those. I'm slowly trying to integrate some of those things now for our family, and it is fulfilling but also hard! Family life is hectic for all people, so I'm finding that having a tradition is something that I have to force for a while. Like a habit. A few months ago I set up a family altar in our bedroom so that we have a place where we can say our prayers that is quiet and away from most of the toys. I've placed our largest Nativity set on the altar along with our Advent wreath and I made a big deal to describe the people to Dominic and explain why they are separated right now. 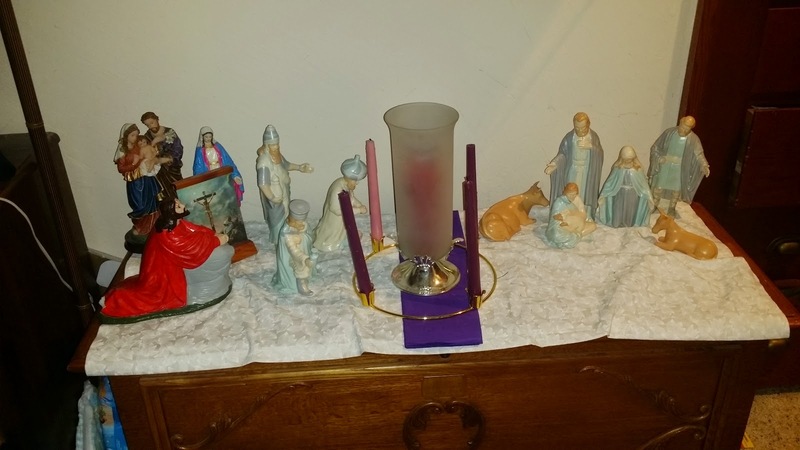 We light the candle and say a small Advent prayer every night before we say our family decade of the Rosary. I've been looking at one of the Little People Nativity sets as well, but I can't decide if I really want to let the boys "play" with the pieces. I understand the idea is to give them something they are allowed to play with so they'll leave any of the breakable ones alone, but I still can't decide. In the meantime, I have this magnetic one on our fridge and Christopher likes to take all the pieces and throw them on the floor. Dominic has been known to line them all as though they are standing on each other's heads. The thing that I'm noticing the most, as I stated earlier, is that creating these rich traditions takes work. Another important thing is to not think you have to do everything! A lot of people have great ideas that seem so amazing and I would love to try, but they just aren't a good fit for our family or where we are right now. Jesse Tree? I'd love to, but I don't think it would be that interesting to the boys right now, so I'll wait a while and maybe try it in a few years. I have a friend who has an Advent tradition of reading a couple short books in the evening and sing a verse of a song (we purchased this one and this one last year and they are lovely), but between Dominic who hates when we sing and Christopher who tears up books, this isn't a good fit for us right now. And that's OK. It's OK if I never make an Advent chain out of paper that we tear apart every day and read and do the task on it. It's OK if it takes us the boys' whole childhood to develop these traditions because that's how traditions are made. We'll probably try lots of things, and those that stick will be the ones that become traditions. 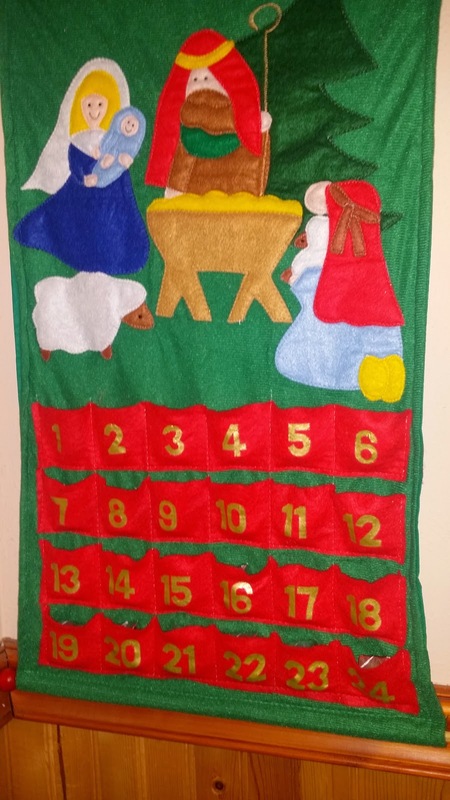 Keep checking in on Beth Anne's blog to see what else there is this Advent! I agree with not trying to do EVERYTHING/TOO MUCH. I think people sometimes get carried away and in their attempts to do TOO MUCH they end up doing nothing. Thanks for participating in the blog-hop! Exactly, I think that moderation is definitely the best.